Small packaging: The PP150 is sized to nicely fit on a back panel without taking up a lot of surface area. The physical dimensions are 8"w x 10"h x 5.5" d.
Auto Single Stroke and COD "Continuous on Demand": Certain projects require special operating modes and these are standard with the PP150. The Auto Single Stroke mode allows a device such as a feeder or robot to initiate a press single cycle. The COD mode allows a device to start the press in continuous mode. After a stop signal is given, it allows the press to stay "armed" while waiting for the next start continuous command. Refer to the PP150 manual for specific adjustable parameters for these features. Resolver or Encoder Position Inputs: The PP150 comes standard, ready to accept a resolver or encoder signal for the press position. Resolver/encoder slave mode: The PP150 is designed to allow a resolver signal to be shared between two controls. With a simple dip switch change, the PP150 turns off the reference voltage and merely reads the signal in parallel. In the same fashion the PP150 will also share the encoder signal between two controls. The Bottom line is only ONE resolver or encoder on the machine for press position. This saves time and money on installation and hardware. Auxiliary Immediate and Top-stop inputs: The Immediate and Top-stop input easily allows an integrator to add additional monitoring devices to the press while giving inputs to immediately or Top-stop the press. 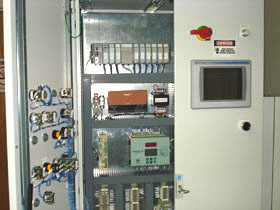 (example; die protection unit, tonnage monitor, PLC, etc.) These are in addition to the E-stop circuit. Binary fault/prompt outputs: The PP150 is standard with six binary outputs that will share up to 64 fault and/or prompt messages. These messages can be integrated with a PLC system to display the PP150 current status on a single operator display. Time-Based Brake Monitor: The PP150 comes standard with a time-based brake monitor and a 90° stop test built in. This is useful to an integrator because OSHA, ANSI and CSA require any "hands in die" application on a stamping press to be equipped with a brake monitoring device. 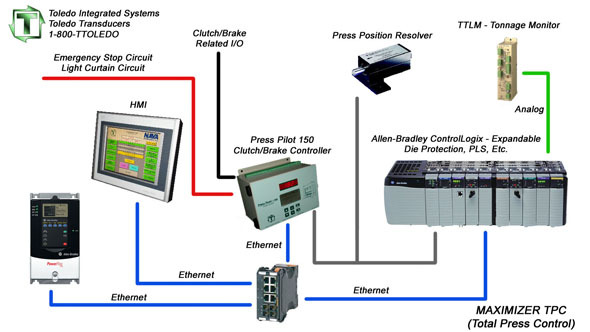 Optional Ethernet communication: Ethernet IP is a standard option for the Press Pilot 150. This option will reduce wiring and will share information with either Allen Bradley Compact or ControlLogix hardware. Information shared includes fault history, brake monitor, resolver position (ref. only), I/O status, etc. This communication also allows certain parameters to be set up. Below is an example diagram of an integrated solution using the Press Pilot 150. See the PP150 Basic Press Control (Basic Press Pilot 150, click here) for the rest of the standard features.